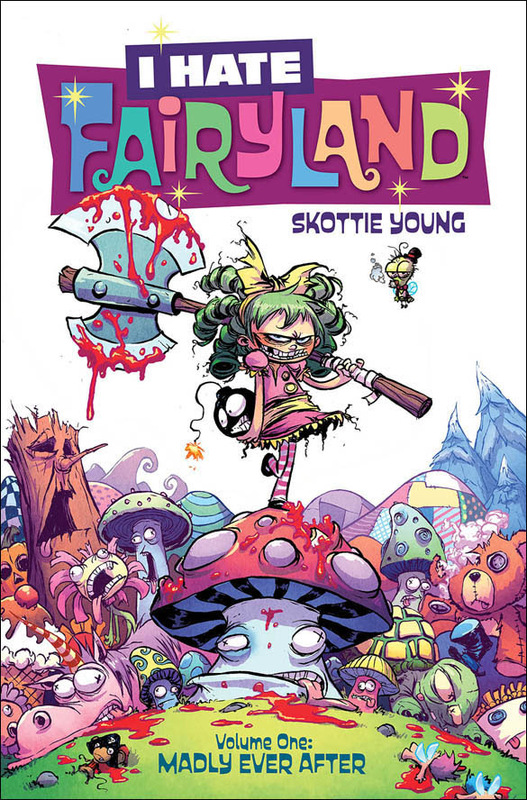 Skottie Young has scored pretty well with I Hate Fairyland, an acerbic take on the premises that powers many traditional fairy tales. Now, the first five issues of the critically-acclaimed series is being collected into I Hate Fairyland, Volume 1: Madly Ever After. I Hate Fairyland, Volume 1: Madly Ever After (ISBN 9781632156853) hits comic book stores on Wednesday, April 20th and bookstores on Tuesday, April 26th, and will be available for $9.99. It can be ordered by retailers from Diamond Book Distributors with Diamond code JAN160644. 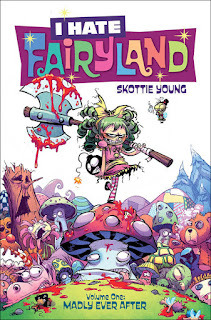 I Hate Fairyland, Volume 1: Madly Ever After is an Adventure Time/Alice in Wonderland­-style epic that smashes its cute little face against grown­up Tank Girl/Deadpool­-esque violent madness. Follow Gert, a forty­-year-­old woman in a six­-year-­old’s body, who has been stuck in the magical world of Fairyland for nearly thirty years. Join her and her giant battle­axe on a delightfully blood­soaked journey to see who will survive the girl who HATES FAIRYLAND. From the superstar New York Times bestselling cartoonist Skottie Young (Rocket Raccoon, Wizard of Oz, Fortunately, The Milk), comes the first volume of an all-new series of adventure and mayhem. This collects issues #1-5 and will be available in April. I HATE FAIRYLAND, VOLUME 1: MADLY EVER AFTER (ISBN 9781632156853) hits comic book stores on Wednesday, April 20th and bookstores on Tuesday, April 26th, and will be available for $9.99. It can be ordered by retailers from Diamond Book Distributors with Diamond code JAN160644. It can be preordered now on Amazon, Barnes & Noble, Indigo, and Indiebound.